Beginning at the age of 2 ½ or for students transitioning into the program, the transitional preschool class offers students an opportunity to prepare for the preschool program here at St. Rita. Students will be immersed in a comprehensive communication environment to continue to build their academic and social foundation as they transition into preschool. The curriculum and classroom routines challenge students at an age-appropriate level. The students participate in both large and small group activities, with a time limit appropriate to their young age. They have opportunities for free play as well as more structured, teacher-directed activities, with an introduction to Montessori materials and philosophy. The curriculum focuses on developing children’s foundational skills and is aligned to the Ohio Department of Education’s Early Learning and Development Standards. Self-help skills such as eating with a spoon, drinking from a cup without a lid, and toilet-training are also worked on throughout the school year. We want all of our students to be able to successfully communicate with others. 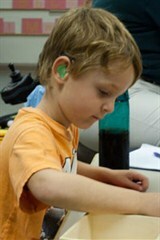 For those students who are implanted or aided, Hearing Assistive Technology (HAT) systems are utilized in the classrooms. Speech and language therapy, occupational therapy, and other related services are provided when evaluations determine such need or the student turns 3 and an IEP is developed. The preschool program is for children 3 to 5 years of age and offers a comprehensive communication environment to maximize each child’s potential for academic achievement and social & emotional development. We believe that our students benefit from the use of sign language both receptively and expressively. The preschool classrooms follow the Montessori Curriculum aligned to Ohio’s Early Learning and Development Standards for preschool. The Montessori environment allows each child to explore and learn at their own pace, and to freely access their entire classroom at all times to take advantage of critical windows of learning for each child. Emphasizing Maria Montessori’s philosophy that each child is an individual who is on a journey of self-discovery, the early childhood program at St. Rita School for the Deaf allows children to learn at their own pace and in their own sequence of discovery. Children who spend longer on one part of the curriculum than others are not left behind in the classroom, and those who master a concept quickly are encouraged to move on in the curriculum at their own individual pace. Abstract concepts are taught using concrete materials for language and comprehension. The goal is to prepare each child for elementary school, both academically and socially, with a strong language base for communication. The Montessori teacher’s primary role is not to merely transmit information from a prepared curriculum, but rather to help children to act and think for themselves, creating an atmosphere of calm, order, and joy in the classroom to develop self-confidence and inner discipline. The teacher demonstrates the correct use of the materials, carefully watches the progress of each child and keeps a record of his/her work. Learning is child-directed and individualized.